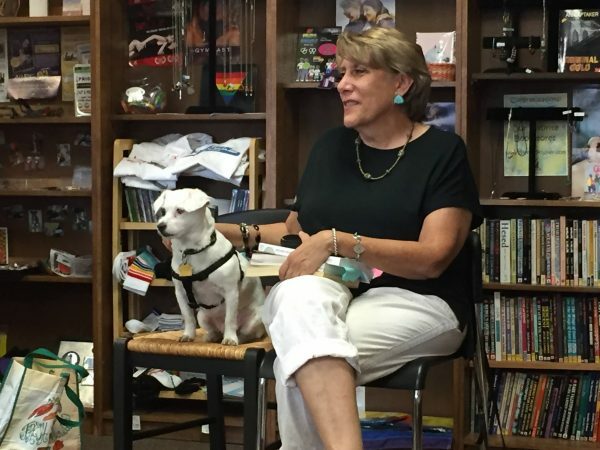 The Author & Her Dog Book Tour: Highlights | Will My Dog Hate Me? We’re back — at least temporarily, at least the pair of us. One of us is heading out again next week. 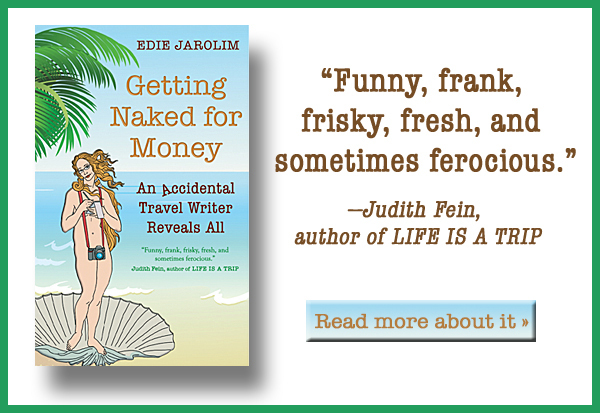 The first leg(s) of our book tour was/were quite the adventure, and I mean that mostly in a good way. Madeleine was universally adored, except by the person whose heel she nipped in New Mexico. I misplaced my iPhone and managed to give the wrong date of a reading to the newspaper reporter who was going to publicize it. Enough said about both of those things, too, at least for now. 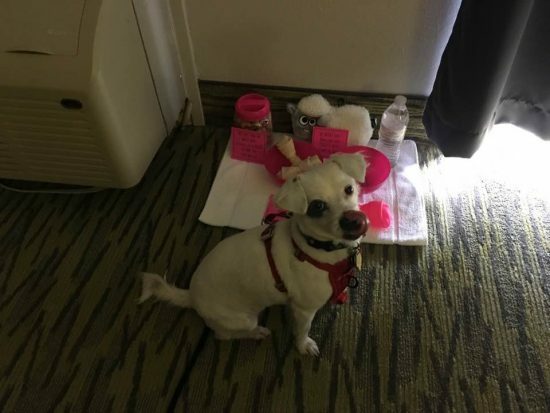 I will write more about the trip but — couplist rant alert — answer me this: Why are there laws against taking your dog into rest stop restrooms throughout Texas and Arizona? If you are single, what are you supposed to do, especially in summer? Leave your dog in a hot car while you use the facilities? I broke the law multiple times, figuring that if I got a ticket I would contest it and thereby publicize the ridiculousness of this regulation. On our first stop, Madeleine scoped out the facilities in the morning, before Peregrine Book Company was open. 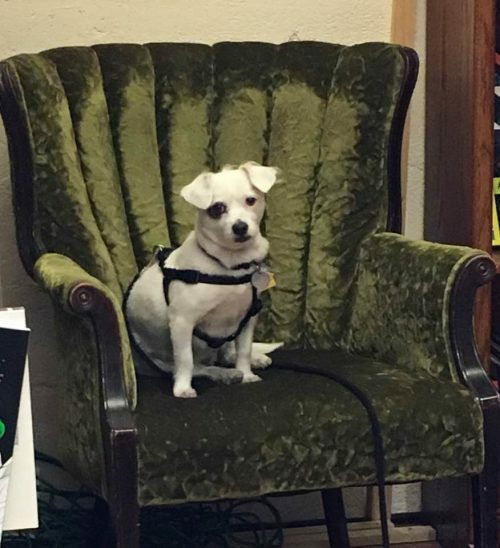 She deemed them more than acceptable, and this was even before she knew that she would have a plush green velvet chair to sit on (see picture, above). Look in the lower left hand corner and you’ll see Madeleine. 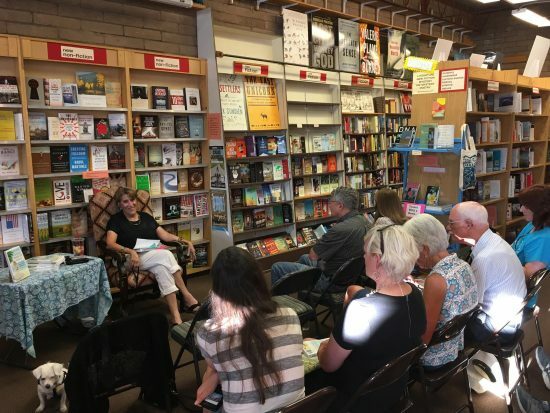 During the reading, she had her own seat in the front row, next to my friend Diane Schmidt. But when Diane got up to take the picture — she’s a professional photographer as well as writer — I took the reins, um, leash. 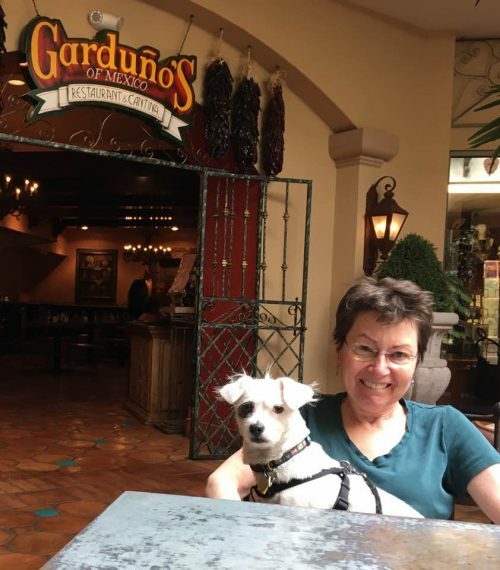 One of the many things I loved about staying at the pet-friendly Hotel Encanto was that you could dine in air-conditioned comfort with your pet at the excellent Garduño’s restaurant; you just needed to sit in the lobby, a few feet outside the restaurant entrance. Because the food was so good, and the restaurant so convenient, we did this several times. In answer to the ubiquitous New Mexico question, red or green (chiles, that is), I tried green one day, and red another. 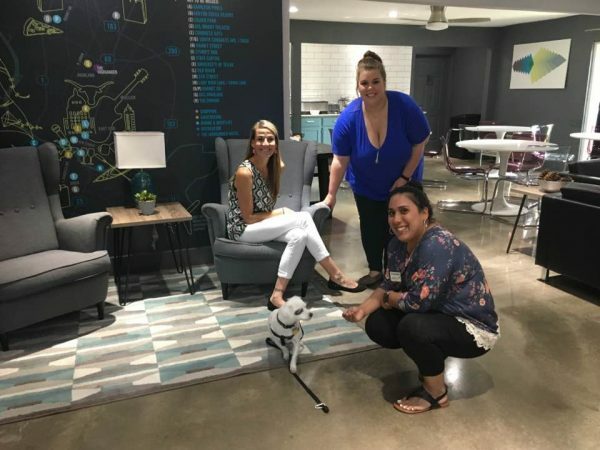 If there are more pictures of Madeleine in Austin than in any other place, it’s because she got the most attention there. I’m surprised she allowed us to leave. Madeleine got some great swag at the fabulous Highlander Hotel. Lip smacking great swag, in fact. The staff of the Highlander didn’t pay any attention to Madeleine at all. Sad. 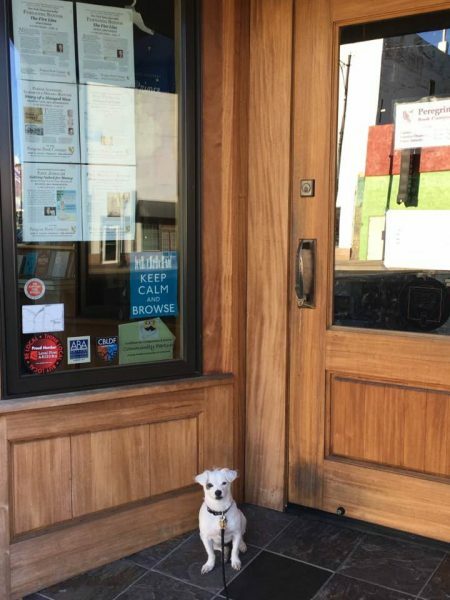 Madeleine was allowed to roam free at BookWoman. At one point she chose to sit next to me. She seemed ready to take questions but none were asked of her. Our visit to San Antonio had a distinctive feline vibe. 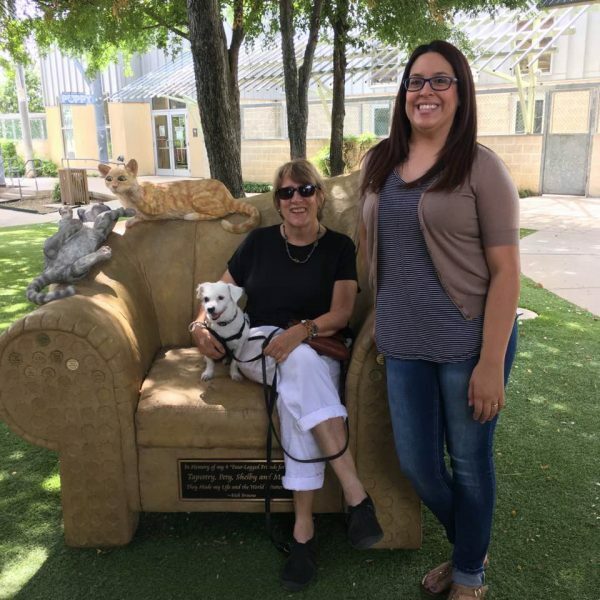 We went to the San Antonio Humane Society, which co-sponsored the book signing: In return for sharing the event on social media, 15% of the proceeds of the book signing was allotted to them. It is not a princely sum, I’m sorry to report. But that too is a story for another time. When we went visited the facility, which is one of the nicest I’ve seen, anywhere, there was a feral cat wandering around. Madeleine pretended not to see it, as is her wont. But more astonishing, we shared an evening in a house with a friend and her kitty, Athena. The two of them co-existed with little stress, even though Madeleine ate all of Athena’s food. I thought that Madeleine was a little under the weather the next morning, the last of the tour; uncharacteristically, she didn’t touch her food. Now I’m thinking that once she tasted cat kibble, she didn’t want to go back. Looks like you both enjoyed yourselves. Sorry the Humane Society co-sponsorship didn’t net as much as you’d hoped; but Madeleine did great, ignoring the cat.